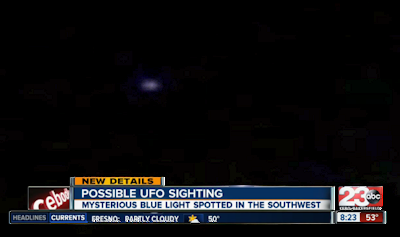 Several neighbors living off Alderpointe Street near Panama and Gosford in southwest Bakersfield say they first witnessed a mysterious blue light in the sky back in February, and again in March. Both times they saw it on the 14th. "I was taking the recycling out to the trash can, and I saw this blue light in the sky, and I thought, that's kinda bright to be a star, I've never seen a blue star be that bright," said Kelly Castruita. "Watched it for about 10 minutes, just doing weird stuff, it would turn on and off and it would disappear," added Kelly's husband Jeff. Neighbors said the blue light was about the size of a dime, and started off just above the skyline, and then migrated northwest. "It pretty much flew, stopped, then started doing some upward motion and downward motion, so I've never seen anything like it," said neighbor Randy Gabriel. . . .